Winter-wise, we’re out of the woods—February is blessedly over—but we’ve still got a ways to go before there’ll be any fresh fruit worth rhapsodizing about. Decent stone fruits and berries won’t show up until May at the earliest, and until then, everyone’s stuck with apples, pears, and (usually mediocre) imports from warmer climes. Unfortunately, we’ve already been stuck with these fruits since last fall, and biting into a fresh, crisp apple is quite a bit less thrilling in early March than it was in late September. So apple-lovers will be forgiven their impulse to gussy up, disguise, and otherwise mess with the fruit in hopes of avoiding another several weeks of monotony. Applesauce is an obvious solution: It’s insanely easy, kids like it (as do most adults), and it changes apples’ texture dramatically—a plus when you’re trying to avoid the same old same old. It’s also so bland that a mouthful will just about put you to sleep. One batch of applesauce—ideally served warm with a drizzle of maple syrup and a pat of butter—will sate applesauce cravings for a year. Enter apple chutney, which is to applesauce what Lana Del Rey is to Lizzy Grant: sexed up past the point of recognition. Apple chutney isn’t an authentically Indian condiment—after all, apples are not native to India, and traditional Indian chutneys are sugar-free and usually raw. Not until the cultural exchange that resulted from Great Britain’s colonization of South Asia would the word “chutney” come to be associated with a cooked-fruit condiment that’s halfway between a jam and a pickle. 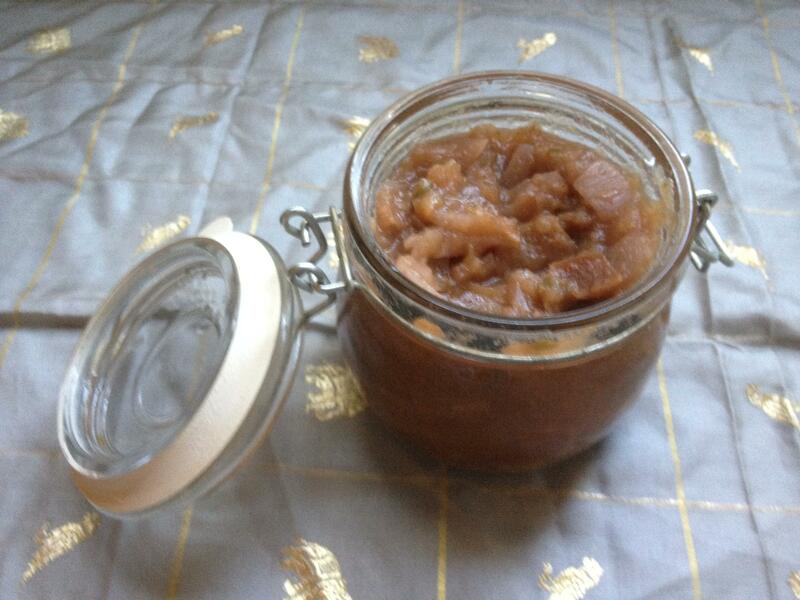 Despite its bastardized origins, apple chutney is authentically delicious. Unlike applesauce, which slides down the throat without leaving much of an impression, apple chutney hits the tongue in all the right places. It’s sweet, sour, and spicy, all at once, and—when done right—it’s hard to stop eating once you’ve started. There’s very little to be said about making chutney; you basically just throw a bunch of ingredients in a pot and cook them until they’ve turned to mush. Since we’ve already abandoned all pretense of authenticity, I like a chutney with an eclectic mix of spices—including that North African trio of C’s (cinnamon, coriander, and cumin)—but you can omit one or more of the spices listed below without doing any damage. You do need a bit of heat, which comes in the form of jalapeño; remove its seeds before mincing it if you want your chutney relatively mild, or keep the seeds and add an extra bit of cayenne pepper if you want it fiery. How you eat chutney is up to you. Spread it on sandwiches instead of mustard, or slather it on burgers instead of ketchup. Dollop it on crackers with cheese (brie and cheddar are both nice). Swirl it into Greek yogurt for a not-too-sweet afternoon snack. Or just eat it plain with a spoon. There’s enough flavor in there that you run no risk of getting bored.